It's another calamity that happened here in Cagayan de Oro for the second time around. 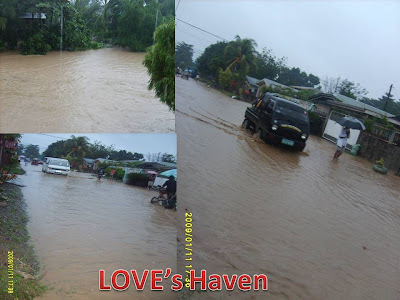 Just last January 3 of this year, thousands of families were affected from flash floods. We thought that it was the last time but we were all wrong. Yesterday at around 3 am if I'm not mistaken the rain started to poured out so hard and didn't stop until last night. We were experiencing the said disaster that we ourselves were on the scene of packing our necessary things ready to evacuate and placing our appliances in an elevated areas. But still, PRAYER is the best weapon for this. Me and my hubby devoted a time together in the morning and in the evening praying so hard for the rain to stop. Indeed God answers prayers. The water in the river bank did subside last night that we were not able to evacuate to an elevated area because we know that we were all safe even though we just stayed in our homes. I know all this things did happened for a reason: this is just a reminder that God is coming so soon and we His children must be ready and prepared to meet Him up! hi, i wasn't able to go online pero when I heard the news ikaw lang talaga naisip ko..i prayed na you and your family are okay. i'm just glad okay lang po kayo. Thank God.